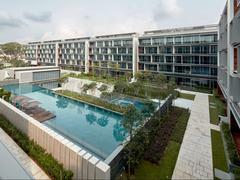 A meaningful engagement with nature was the driving thought behind the conceptualization of Seletar Park Residence. Upon arrival, mature rain trees line the entrance at arrival, greeting the visitor ceremoniously before the space extends into a clearing, embraced by surrounding terrain. This theme is recurring and seeks create a home that first welcomes and, later, offers encounters with nature. Fine edges and sharp lines break down the massing of the residential blocks, while offering a textured fabric through the repetition of frames, sun-shading ledges, fins and trellises. Rigorous in its application, this fabric lines the site boundaries, forming a canvas onto which a central landscaped court is strongly expressed. To create intimacy in the vast court, the ground plane is separated into two; one of which is sunken and leads down into the basement level via a set of landscaped stairs. The main pool is placed on the higher plane, creating a reflected vista towards the clubhouse, which is furnished for the residents’ enjoyment. The pool then breaks down into several smaller cascading pools in the sunken half, with large planters interspersed to appear as floating landscapes, and culminates in a tranquil reflective pool and shaded court, shared with other communal clubhouse facilities. Spatially, each apartment is provided with a balcony or private enclosed space stretching across the entire length of the unit, thus extending the interiors to the outdoors. These intermediate spaces are finished in timber, allowing the palette of natural materials and colours to flow from private to communal spaces. The interaction of the living spaces with the lush gardens and water courts engenders a sensuous engagement with the elements, resulting in a calming, peaceful environment.